"Every student in every school on planet earth and outerspace colonies to know Sumerian". 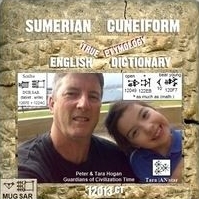 If you used the multi-purpose "Mugsar Immortal Benefactor Variable Amount" button for the "let Pete pick something to sponsor" or to get your Customized Mugsar Collector's Edition Platinum | Gold | Silver options, and haven't had any contact please email him at sumeriancuneiformdictionary@gmail.com with your ideas for your MIBR listing and to make sure we know we have the correct details of where the PayPal contribution came from and what it is for. Even if we had prior contact, a quick email to confirm you completed the PayPal process would be appreciated so we can check with PayPal to make sure everything worked OK, and we get all your details right. Thank you again, and looking forward to a long association between us and our offspring. Perhaps we will meet in person some day at the inaugural international MugsarFest at the newly designated Mugsar worldwide headquarters, wherever that maybe, all of which you helped to make possible. In the meantime, let us know about anything in particular you can do to promote the Mugsar, like being VP Marketing for your region, and about any family members that might be interested in a career with the Mugsar or an altruistic (partnering with a Not-For-Profit) local MugsarFest Internship, that could help them get into Harvard. Now, we have to get your Customized MCE, Virtual Tablet In-Scribe and MIBR listing just right. So Pete will be in contact with you soon.